All Tangled Up- The McKillops are a founding family of Elgin County; this farm is now managed by the seventh generation. Originally from Lochgilphead in the Highlands of Scotland, Duncan McKillop and his brother Archibald (30312 Talbot Line) were among several Highland families who arrived in 1818 on the ship, Mars. 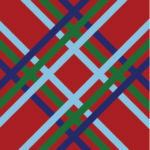 The colours represent the McKillop tartan. The barn quilt has been moved to the Eagle Community Centre not far from Lake Erie. Below is Beth McKillop and her mom, Betty, attending a luncheon celebrating the relocation of “All Tangled Up” to Eagle Community Centre. It was originally installed on their barn just west of Eagle.